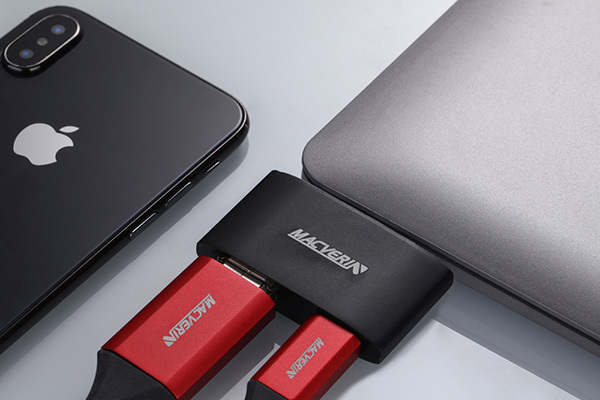 MACVERIN C001 is a Dual Type-C to HDMI 4K*2K @30HZ Converter.2 type c ports which connect with Macbook to extend HDMI, other side also has one type C port for PD charging Macbook. This converter has newest USB3.1Type-C ports, used for Phone/Computer to large screen display,audio and video output, it is compatible with all Type -C ports laptops. Such as Macbook,Macbook pro, Google, ASUS,HUAWEI mate book,Lenovo YOGA 5 PRO, Microsoft 950,950XL,LG G5 G6 ,HTC ULTRA and Samsung S8. This Type C to HDMI converter supports Audio and Video synchronization transmission, plug and play in real time, mobile and tablet mirroring with HDTV in real time no delay without Carton, Support to check photo, video,surfing Internet ,playing game and video calls etc.